I used the October My Paper Pumpkin Pining for Plaid kit to create 2 alternative designs. Both cards use the card bases from the Stampin Up My Paper Pumpkin kit and I added a strip of DSP from the Merry Little Christmas #144621 collection and added the printed card from the kit. For the top card, I used my Stampin Up trimmer to create segments and layered them with pop dots to create the telescoping effect. My friend and customer Mindi took advantage of the Stampin Up Stitched with Cheer Project Kit #142012 to get a “jump start” on her holiday cards. 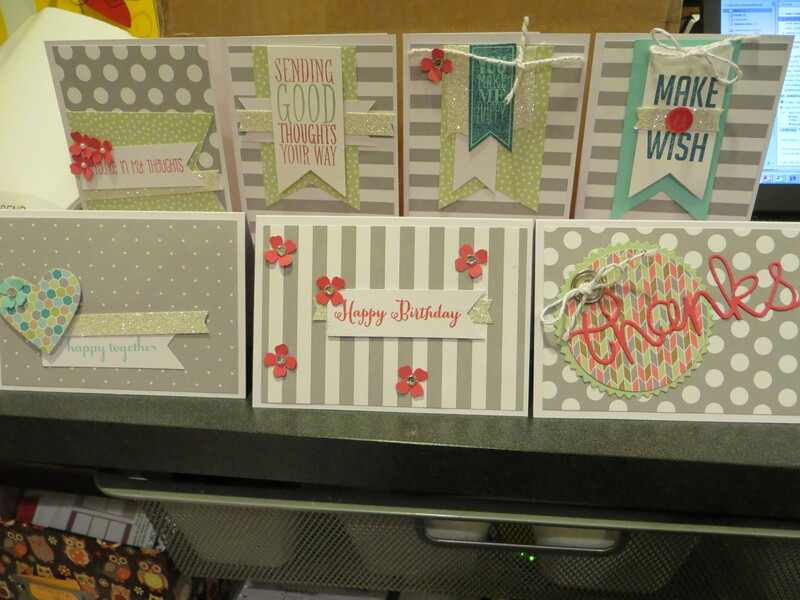 Kit includes enough supplies for 18 cards, 6 each of 3 designs, and 18 kraft envelopes and envelope liners. Mindi had to refresh her handstitching skills by watching a You Tube video,but none the less she sewed up the holidays with these completed hand-stitched cards in festive designs. If you love these cards you can get the Stitched with Cheer project kit while supplies last during the Year end clearance sale. This is my friend Mindi who recently has caught the stamping bug. She bought a D Size block and no stamps because she loved the acrylic block. Once I turned her loose with stamp sets to practice with she purchased both card kits from Stampin Up and completed her first card from the Watercolor Wishes Card Kit #140406. This card is exceptionally special because today her daughter left Ohio to be a year long exchange student to Germany. Safe travels to Maddison! I recently introduced my good friend Mindy to stamping. From the time she held her first block in her hand and stamped her first image she was hooked! So she wanted to start stamping her own cards and today’s card is her first card! With the help of the Stampin Up Water Color Wishes Card Kit Mindy is now a card maker. The Watercolor Wishes Card Kit #140406is a great way to get started because it is an all inclusive kit giving you everything you need to make 20 cards. From now thru September 10th all first time My Paper Pumpkin subscribers will receive 50 % off you first 2 months subscription. As a My Paper Pumpkin Subscriber,each month you’ll receive an orange box with darling curated projects—sometimes cards, sometimes gift packaging, sometimes both!—that you can complete in less than an hour. All supplies and instructions included. I’m always delighted at the projects I have received each month. When that orange box shows up in my mailbox I get so excited. I hope you’ll give Paper Pumpkin a try and enjoy this fabulous get-started special at the same time. Just go to my personal My Paper Pumpkin link and enter HALFOFF as the promo code and sign up so you can begin to get in on the My Paper Pumpkin fun. Today’s post is a sample of the May 2015 My Paper Pumpkin card kit. I worked the card up ccording to the provided instructions in a snap using all the provided elements except for adhesive. I usually like to get creative and do alternate designs but have not done that yet with this kit. I decided to get a jump start on my Christmas cards this year. 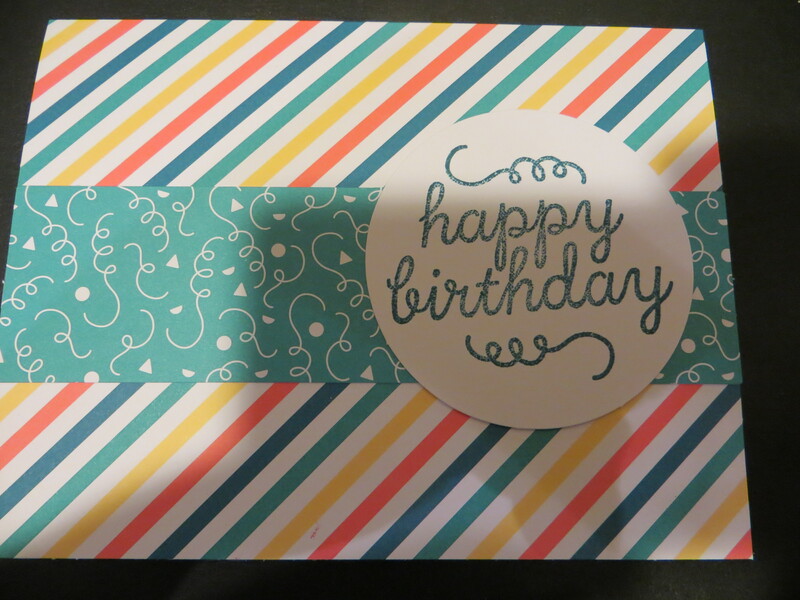 I made this simple but elegant card and decided to make it available in a kit. This kit includes all the pre-cut fixins to make 3 cards and it priced at $10 for 3 cards or 6 cards for $18 plus shipping. I don’t have a secure payment opition at this time so If you are interested in purchasing a kit leave a message and I will contact you privately for the shipping information. Once I receive payment, I will cut and prepare you kits for delivery. This card features the gorgeous brushed silver cardstock #100712 $7.95, Northern Flurry Embossing folder #120902 $7.95, Real red satin ribbon #117286 $8.95, rhinestones#119246 $4.95 and Warmest of Wishes Hostess stamp set.